Indian thought-currents are deeply rooted in the theory and concept of rtam as the framework in which the process of creation, sustenance and dissolution operates. It views man and nature in a holistic perspective. Space, time, primal elements are the essentials as are the primary faculties of sense perceptions. The scholars have been investigating many dimensions of these fundamental concepts from at least a couple of decades. The author in the present book has entered into an intensive holistic dialogue between and amongst disciplines ranging from art history, archaeology, anthropology, sociology, philosophy, astro-physics, micro-biology and to a variety cultures. But, the main premise of the volume is based on the Shaiva thought and Art of Kashmir. Kashmir with its hoary past and bewitching beauty, philosophical intellectualism, mystic spiritualism and artistic traditions is a paradise on earth. It has been crucible for refining human thought, be it the Vaishnava cult, Shakti cult, Shaivism, Buddhism or Sufism. Kashmir has recognized the existence of various paths to reach the absolute truth. The book tells us complete story of Art. 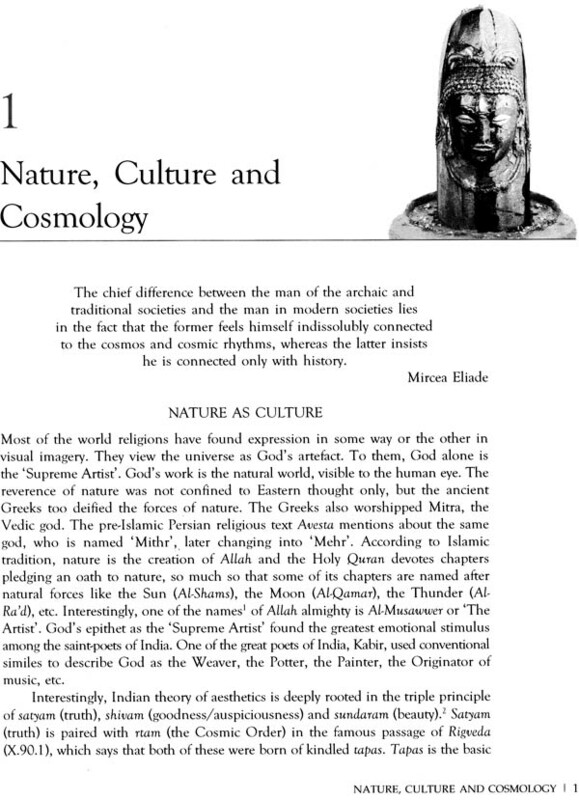 It gives an insight in the inter-connectedness of nature, culture and cosmology; cosmological interpretation of Kashmir Shaiva art and its metaphysics; Kashmir Shaivism and its synthesis with the sciences, etc. The fascinating richness of this book lies in both the “mythological” and “scientific” aspects of Art which provides a conceptual explanation of the nature of art. It has highlighted the new paradigm emerging in the scientific circles that is inclination towards a spiritual interpretation of the cosmic reality. 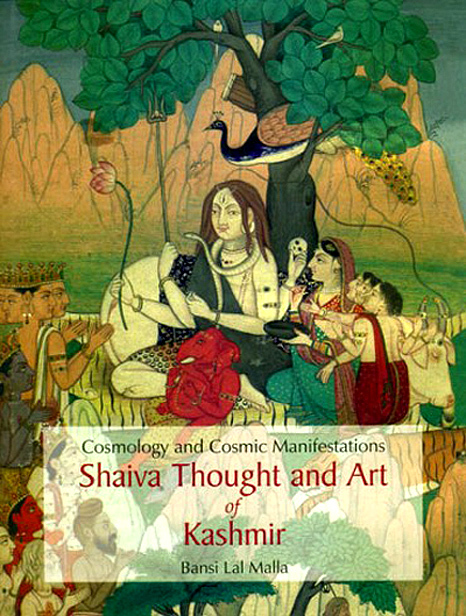 An attempt has been made to link the basic facts of Kashmir Shaivism with the scientific truths in this volume. It is a welcome addition to the rather sporadically treated subject with a considerable material for thought and comparison. With this work, not only the historians of Art but anthropologists of religion and scientists of environment, space and cosmological studies would be in a position to follow the fascinating thought trails in Art and Nature. Dr. Bansi Lal Malla, an art historian, with specialisation in Indian art and cultural studies, is a associated with the Indira Gandhi National Centre for the Arts, :New Delhi. 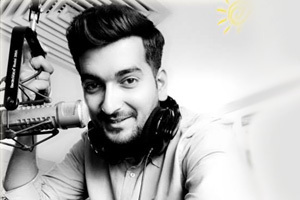 His areas of interest include both classical and vernacular traditions, He has been associated with the IGNCA-UNESCO-UNDP project on 'Village India'. Dr. Malla is the author of a number of books, including The Sculptures of Kashmir, vaisnava Art and Iconogrophy of Kashmir, Trees ill Indian Art Mythology and Folklore, Conservation of Rock Art (ed.). Global Rock Art (ed.). The World of Rock Art: All Overview: of the Five Continents (ed. ), Rock Art Studies (Vol. I): Concept, Methodology. Context. Documentation and Conservation (ed.). Rock Art Studies (Vol. II): Interpretation through Multi- disciplinary Approaches (ed.). Rock Art or Andhra Pradesh: A New Synthesis by N. Chandramouli (General Ed.) and of a number of research articles published in professional journals. Dr. Malla has participated in a number of national and international conferences/ workshops and has widely travelled in India, France, Italy and Iran in connection with his field studies and conferences. Currently, Dr. Malla is engaged in documentation, ecological conservation and ethno-archaeological study of Indian rock art; and also in Himalavan studies. The Semitic religions and European sciences have developed a world based on anthropic principle. The book of Genesis (Old Testament) states that 'God created man in His own form and breathed in him the breath of life and man became a living soul.' Whether God really created man 'in His form' or not, is still a mystery. However, one thing is sure that man creates God in his own form and has been doing so since times immemorial. Because, with the intellectual development of human race, man essayed to control nature to his wishes by chanting prayers before an evolved form of some mental image of divine person or deity. This process was named by the philosophers as 'Natural Religion'. At present, anthropology has distanced itself from the sacred science of man-the natural philosophy. Since the anthropocentric or technocentric understanding of cosmos is limited, the cosmic understanding of culture is boundless. If both the cosmic and anthropic aspects are combined, one may discern a crucial dimension of human self-organising system. The traditional vision leaps into anthropic principle to appreciate the dimensions of the universe. Besides, the quantum theory has taken physics far beyond the findings of Newton. Heisenberg's 'uncertainty principle' puts an end to the clear separation between the observer and the observed. The paradigms of physics, cosmology and biology are becoming a close companion of ancient philosophy and religion. The Indian philosophy, irrespective of ethnic considerations, views man and nature in a holistic perspective. The experience of the culture is codified in its thought- currents, astrology, and ayurvedic system of medicines, etc. Indian thought and art are deeply rooted in the theory and concept of rtam, as the framework in which the process of creation, sustenance and dissolution operates. Its most important meanings include Cosmic Order, Truth, Nature (Dharma), Beauty and Continuous Flow. It regulates the cosmos into a systematic whole. Furthermore, this all-inclusive principle of cosmic harmony and human order pervades all the aspects of life: the natural world, the human world, the social world of everyday community life, the moral world, and the realms of arts, creativity and architecture. Interestingly, the planet earth consists of 70 per cent of water. Whether ocean or ice, cloud, snow, rain, spring, river or lake, water is part of the dynamic flow between land, sea and air. The water content of the human body is identical to the planet earth. Ancient cosmologists also conceive water to be the primal element of creation. These similarities mark macro-micro correspondence between nature, human body and archetypal ideas of various civilisations. The ancient sages have traced the origin of the five elements-water, fire, air, sky, earth-from the void and darkness engulfing the world. The interlocking and overlapping of elements have been described metaphorically. They conceived a world of matter, arising out of space and disappearing back into space. They infused the image of Purusha into the conception of Brahman, and traced the course of evolution from the primal Atman, through the elements. It speaks of the interrelationship between the soul and the elements. The individual soul (Atman) is identified with the infinite Great Soul (Parmatma), and the apparent paradox has been resolved by introducing the term Brahman, the expanding one. The different Indian philosophies believe that there are many ways of perceiving truth and determining the relationship between God, nature and human being. Hindu view of the cosmos emphasises that the world is a family (Vasudhaiva Kutumbakum). This philosophy goes beyond the moral realm and is a cornerstone of a plural and secular society. In the north (of India), there is a mighty mountain by the name Himalaya- the abode of perpetual snow, fittingly called the Lord of mountains, animated by divinity and its soul and internal spirit. Spanning the wide land from the eastern to the western sea, he stands as it were like the measuring rod of the earth. Kashmir, situated on the western part of the Himalayas, has been a seat of learning and erudition from its hoary past. Its beauty and verdure, snow-capped peaks, sheen of sparkling waters, rustling leaves of dense forests, lakes and springs have charmed poets and creative minds to sing its praises-calling it a 'paradise on earth'. Inspired and motivated by the pristine beauty of landscape, the myriad- minded genius of Kashmir has immense contributions to make to all segments of human knowledge and creative ventures. Poetry, painting, sculpture, architecture, religion and music are some such domains that are vitally enriched by the Kashmirian share of contributions. Kashmir has recognisably carved a niche for itself in the total fabric of culture of the Indian subcontinent, and any attempt aimed at diminution of its role-profile as such does not deserve notice. The Kashmirian style all through the ages-right from its seminal stages to the present state of civilisation-has been that of tolerance, mutual goodwill and humanism resulting in forging and strengthening of social bonds primarily responsible for shaping of a cultural ethos, which, in turn, affects the life of people living in close touch with it. Kashmir did not only receive various religious, intellectual and art impulses, but also gave them a new shape with a view to transforming them to suit its own religious, intellectual and aesthetic needs and aspirations. There has always been an active exchange of ideas going on between Kashmir and the rest of the Indian subcontinent. Mountain ramparts never proved a barrier to the flow of religious, intellectual and aesthetic thought-currents and trends into Kashmir, leaving their imprint on the local genius only to generate a new ferment, which resulted in the enrichment of the cultural mosaic deeply entrenched in, and reflecting the life of the Kashmirians as a whole. Synthesis and assimilation have been the keynote of Kashmirian culture. There has been a close association between the cult of Nagas and that of Shaiva. 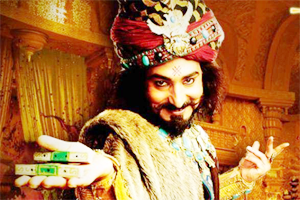 Sesha was considered the son of Shiva. Such an attempt at compromise was also made between the cult of Vaishnava and the cult of the Nagas. The Nagas became Vishnu in the seshashayi form, which belongs to water cosmology, and his images are made accordingly. Buddhism, Shaivism and Vaishnavism with their cult resulted in a new mould of religion, ritual, worship and myth-making. The interaction between Buddhism and Shaivism, Shaivism and Vaishnavism, and again between Buddhism, Shaivism and Vaishnavism and the indigenous cults and thought- currents generated new values of humanism, thereby vitally enriching life and aesthetic standards allied with it. The resurgence of Buddhism in the later periods of Kashmir history was accompanied by a silent tension, which had crept up between Buddhism and Hinduism. The tussle resulted in a deep understanding between the two philosophies at the intellectual level, thereby giving birth to the Trika philosophy of Kashmir Shaivism. It held sway not only in the Kashmir of that period, but continues to provide a common bond to the people of diverse faiths even today. The Trika philosophy represents a fusion and elements of both Advaita Vedanta and Madhyamaka Buddhism. Both, the Trika philosophy and the Islam are monotheistic in character. There is hardly any difference, for instance, between Pratyabhijna and Wahdat-ul- wajood, and Om-Soham and Hamah-Ost. It is believed that the Rishi cult of Kashmir (in its indigenous form), a synonym of Bhakti, was the outcome of the intermingling of the Trika and Islam. Both seem to converge at the same focal point of self- realisation and self-consciousness. It was in reality the resurgence of an indigenous tradition of the unique Kashmiri psyche known for its tolerance, secularism, universal brotherhood and love; in short, humanism. But, the present-day attempts to isolate Kashmir from humanism and synthetical modes of thinking cannot be overlooked as a mere aberration as they are aimed at destroying the essential genius of Kashmir. (Shiva is all-pervading and present in each particle. Never differentiate between a Hindu and a Muslim. If you are shrewd and intelligent, know THY SELF. There lies acquaintance with God). o God! Grant me the same spiritual powers. Both, Lalla and Nund Rishi, emphasised on the importance of overcoming the senses and the wavering mind and concentrating instead on meditation (sadhana) as a means to attain salvation, the emergence of individual soul with the Universal Consciousness. It really meant the realisation of the Divine in one's own being. 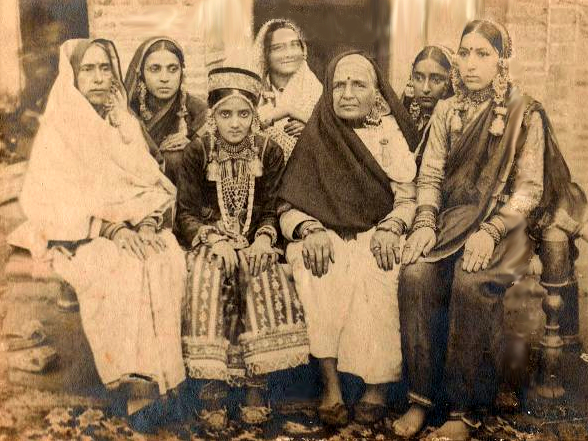 This mystic ecstasy tradition was continued, enriched and strengthened by later mystic poets and poetesses like Roopa Bhawani, Parmanada (1791-1874), Shams Fakir (1834-1904), Abdul Ahad Zargar (died in 1988) and a host of others. Under the tremendous impact of Shaiva thought-currents and due to the patronage of many kings in Kashmir, a large number of Shaivite images were made inside Shiva temples as well as depicted in form of reliefs on the body of these temples. 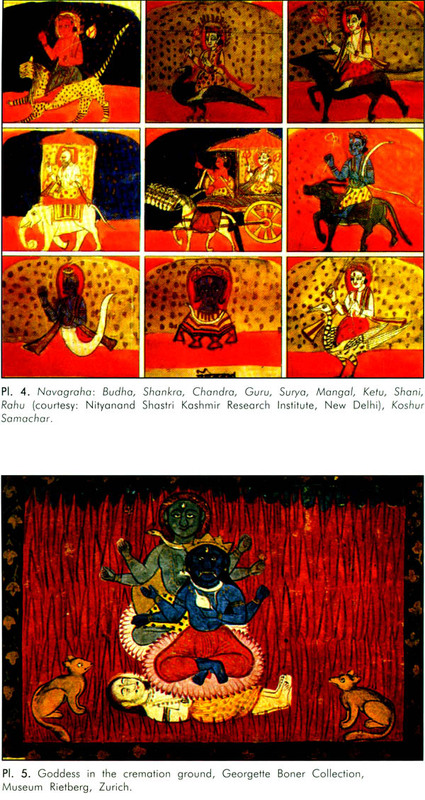 In Kashmir, the presence of Shiva in art has been depicted in his avyakta forms (symbolical), in vaktyavakta forms (symbolical as well as partially anthropomorphic), and finally in vyakta forms (anthropomorphic). The excavations and explorations laid bare different aspects of Shaivite images but the number of lingas outnumbered the human representations of Shiva (vyakta). Shiva is depicted in different mediums, in all possible forms, i.e. seated, standing, dancing, riding on his mount bull Nandi or a chariot, and even in linga form. He appears in Saumya, Ugra and Samhara forms, in which he has different functions to perform for the benefit of the gods at one level and for the benefit of the universe and humanity at another. In Saumya rupa (Anugrahamurti), Shiva is compassionate, benevolent and bestower of the bounties. In his terrific forms, Shiva is depicted as the destroyer of various asuras and devatas. Someone has rightly said that faith begins where reason ends. But as an individual with an average faculty of reasoning, many questions crop up in our minds. Are we so dumb that we cannot find any reasoning in faith? Should we always suspend our judgement? While looking at the universe as a perfect harmony of cause and action, we fail to comprehend how anybody, howsoever exalted, can breach the supposedly unaltered universal law? It has been generally claimed by the spiritually elevated people as happening. But the common people-with their mind- set at the gross level-cannot understand the phenomenon. It is at the gross level generally that human beings come into contact with the god men and god women. The author of the present volume would like to address some of these above concerns through Kashmiri Shaiva thought-currents. In one of his earlier publications on Trees in Indian Art Mythology and Folklore (2000), he has taken up a holistic and scientific study of the 'tree symbol' to know the promptings for its adoration. The Shaiva thought and art of Kashmir represents the universal law of cosmos and Shiva (Sadashiva) as its primordial manifestation. The Great God Shiva has eight forms (Ashtamurti) both in his cosmic manifestations and on the individual level. In Shaiva tradition, the cosmos too comprises eight components, namely the five elements (space, air, water, fire and earth) and also the sun and the moon, which are the measures of time. The eighth is the Brahman, that is, man in his consciousness. Shiva Ashtamurti dwells everywhere, and over and above, it dwells in the human body (in his consciousness also). Kashmir Shaivism with the Trika, Spanda, and Pratyabhijna concepts has been discussed at length by various scholars. 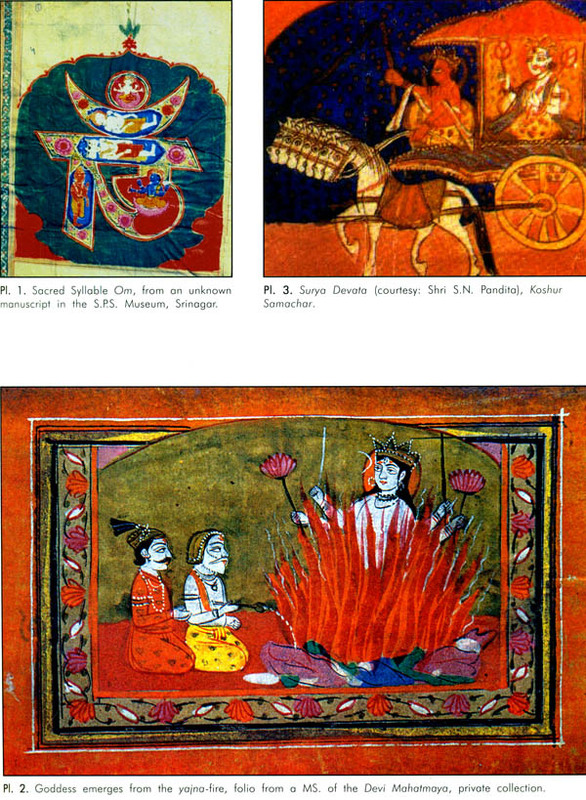 Unfortunately, the Shaiva art and iconography, which was a hand maiden of its prevailing philosophical and religious system, could not fetch the desired amount of recognition to Kashmir. Similarly, the interrelatedness of the Shiva and Shakta cults were not duly propagated and highlighted. In fact, both these cults are the two sides of the same coin. 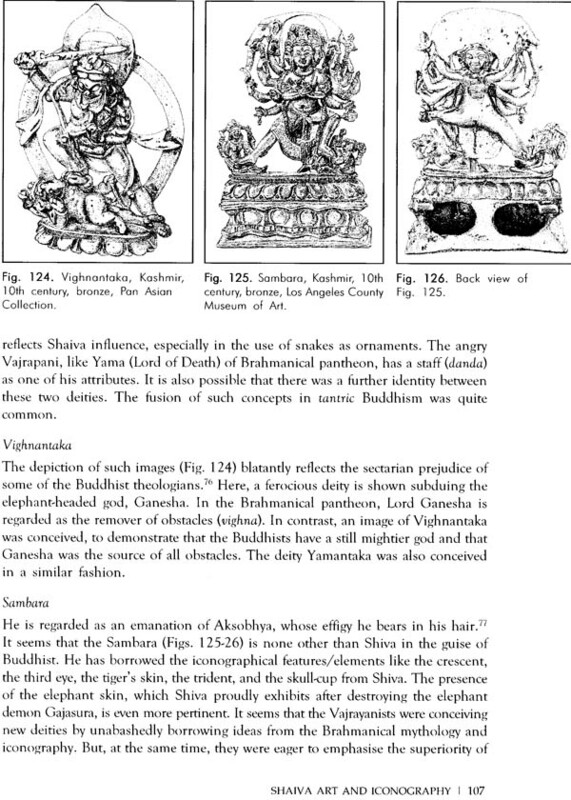 The Kashmirian contribution to the domain of Shaiva and Shakta art and iconography has been both peculiar and enormous. Hence, it deserves a. holistic and scientific study.